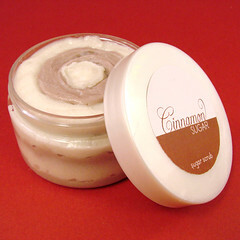 Cinnamon Sugar fragrance is our soon to be released scent just in time for your holiday projects. 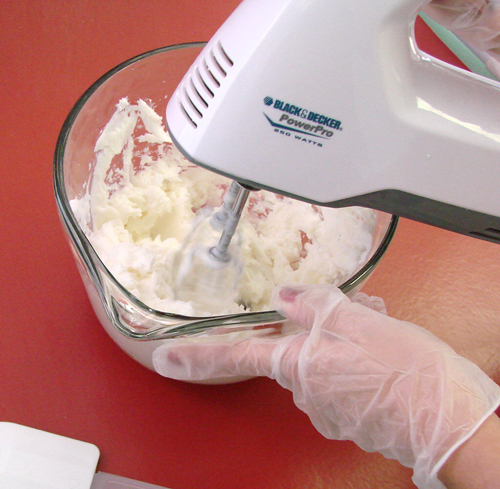 Making your own scrubs couldn’t be easier with our Foaming Bath Whip. Unlike traditional oil based scrubs, you don’t have to worry about this one separating or leaving a slippery mess in the shower. Try variations with Jojoba Beads, Cranberry Seeds, or Pumice. This is the first project in our Christmas Gift Idea series. Once we’ve shown you all of these projects, you will have the knowledge you need to create delightful gift ensembles that are the perfect gift for holiday party gift exchanges, office co-workers, as well as family and friends. We think making holiday gifts with your children or friends is an ideal way to spend quality time with the ones you love. update: Learn to make bath fizzies here, guest soap here, and lotion here. Mix on low until the FBW is smooth, then switch to high to whip up the butter. Whip until fluffy – this usually just takes a couple of minutes. Stir in the sugar by hand. We used a slightly coarser grade of unbleached sugar but regular granulated sugar works fine. When stirring in the sugar by hand, it’s more of a folding. The mixture is thick enough to suspend the sugar and make it into a dense whipped cream feel.Check in tomorrow for how to add color and do a fancy layered look in the final jar. I normally use my scrubs in the shower and add a preservative to my recipe. Would I need to add preservative or does the FBW already contain one? Thank you. Thank you very much! I can’t wait to try this recipe and many others with the FBW! Hi Anne-Marie. I just stumbled upon your site and Brambleberry. Wow am I loving it. I have never made any homemade toiletries so I am super excited to start. What oil would you suggest using to make this as moisturizing as possible without costing a fortune to make? Is there anything else that can be done to make it extra moisturizing for super dry hands? Great recipe and very creative. Would love to try it. 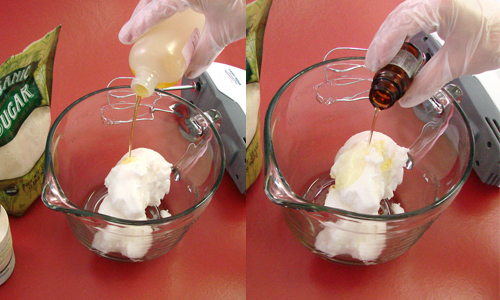 Could I substitute the foaming bath whip for something else (maybe a mixture of butters)? You can definitely substitute a mixture of butters for the foaming bath whip, but the consistency is going to turn out a bit different and it won’t be as ‘foamy’ in the shower as this particular recipe. 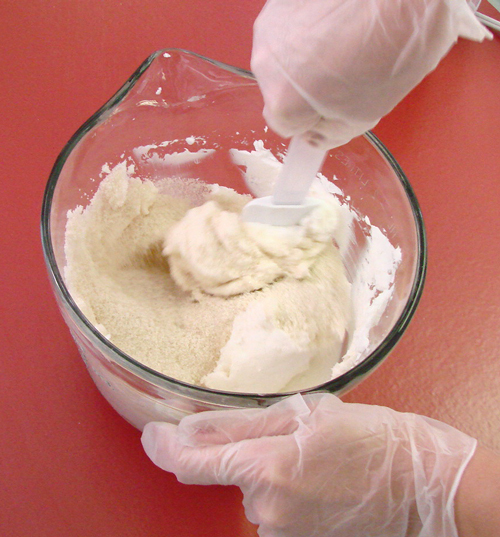 I was wondering when using the foaming bath whip in a scrub like this with colorants and additives, how would you order your ingredient lable to coincide with regulations? P.S. You can usually assume that preservative is used at a 1% amount or less. Therefore, if your colorant is less than 1%, you’ll want to include it after the preservative. If your fragrance is over 1%, you’ll want to include it in front of the preservative. The percentages is exactly what I was looking for, thank you soooo much! How long is the shelf life on these once they’re made? Will they “deflate” or separate over time? I’d like to make a big batch at once to give as gifts over the course of a year and I would hate for it to go bad and be wasted. The shelf life of the foaming bath whip is about a year (best if used within 1 year of purchase). It whips up great and, in my experience, stays nice and fluffy. It will get a teeny tiny bit harder as time goes by but it will still hold its fluffy look. Thanks Courtney! I know some products once mixed together end up with a life of 3-6 months. Good to know that if I start now I can get a head start on holiday gifts! It depends on how much sugar you use but you’ll end up with 48 to 64 ounces of product. Depending on what size jar you use, you’ll need at least 12 to 16 jars if you’re using 4 oz. jars. I’d like to try Ashleigh’s recipe for a sugar scrub; however, I am looking for my end result to be something that I could dispense in a squeeze bottle vs a jar. My question is, how would I make this more of a liquid vs a paste without loosing the scrubbiness? You could utilize more water to make a more free flowing scrub that could be squeezed. So….did Ashley ever share this awesome surgery scrub recipe? She did, she did. I need to get her permission to share before I share but it looks really nummy. Alright everyone. Ashleigh gave us permission to share her recipe. Here it is. Thanks Ashliegh! 1.Put the macadamia oil, cocoa butter and emulsifying wax in a heat proof bowl and heat in 30 second bursts in microwave until melted. 2.Once they have melted, leave to cool until it is only lukewarm, add your rice bran oil and beat until well mixed with a hand or stand mixer and starting to look like whipped cream. 3.Add in your preservative and beat mixture well, should be white and fluffy but still in partial liquid form, like a pale fluffy cupcake batter. 4.Split now if scenting with different scents, otherwise add your fragrance and mix well. 5.Mix in your sugar now by hand with a spoon, until it is to the texture as you like. 6.Pour into your containers and seal, leave to set at room temperature. I put my scrub into big 250 gm bail jars, I also match the scent with a few tablespoons of coloured jojoba beads. Its showing 2 different amounts of the Ewax. Is Ewax and Ewax NF different? Both will work fantastic! They are just in different forms. I would love to have the recipe from Ashley so I can try both recipes. Can’t wait to try this one from Soap Queen. 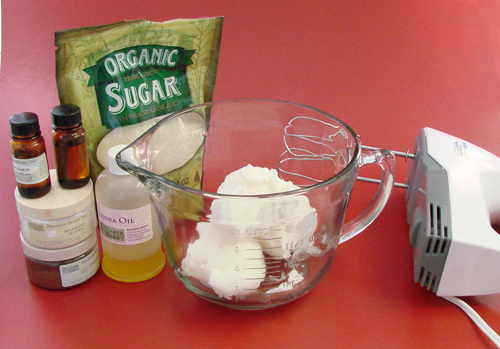 I have this fantastic Whipped sugar scrub recipe that’s a favourite of my friends and family. It involves using emulsifying wax, macadamia oil and cocoa butter into which you add rice bran oil and whip when it cools, adding your preservative and then your fragrance and hand mixing in your sugar. Its gorgeous, creamy and moisturising. I always scent it with a mix of Vanilla and Sandalwood also. It’s quite literally my best seller. This one looks yummy, i may have to give it a try! Thanks for the recipe idea, Ashleigh! It sounds so luxurious. Do you add any water to the recipe at all? Or just the oils and ewax? Just the oils and wax, I can send you a copy of the recipe if you want? It really is lovely, I did a batch a couple weeks ago with your lovely black amber and lavender, it turned out great! We would loooooooove to know what that recipe is! =) info (at) brambleberry (dot) com is our email. Thanks so much for the offer. You can easily split the batch. Add the sugar and the extra oil, mix that in well. And then, split and stir in fragrance into the separate bowls. Thanks for the tutorial. This looks wonderful! I can’t wait to try it. I was wondering, is it possible/easy to split the batch and add two different fragrances? Wow, that’s a pretty good amount for when you have a lot of family to get a present for! Thanks for commenting back! I’ll be lined up to buy the first copy hot off the press. 😉 Make sure to keep the large, clear, step-by-step photos, please! I’m glad you made the conference and enjoyed it. That’s a great idea. We will eventually get to it =) There are so many cool new things to always be working on around here and that is definitely one of them. After all, half the work has been done so that seems like a natural progression. Is it wrong that I want to eat this? 🙂 LOL! What a beautiful product!! And, now I can’t wait for the Cinnamon Sugar fragrance to come out!! Hi there! I follow you on Twitter- you’re really fun and inspiring as a person. I was wondering how many of the containers does all this fill. I think the women of my family would like this very much for Christmas!! Pardon me if I’ve asked this before (bad memory), but I wonder if you could, maybe once a year or once every couple of years, compile all the projects that you showcase here in a book (spiral bound would be heavenly)? I get a little tired of printing these instructions out and then hole-punching them for a 3-ring binder. Wonder if there’d be enough interest for you to make that worth your while? Thanks for the labels. What is “Label Stock”? Is it an Avery label form from an office supply store? I learned so much from you at the Dairy Goat conference – Thank You.